This One-Sheet-A-Day math drill workbook is for 3rd grade students who want extra practice with two numbers, three digits subtraction. It contains 200 math practice sheets, one for each school day of the year. Upon completion, the student will be more competent in 3rd grade mathematics and ready to proceed with more difficult exercises. 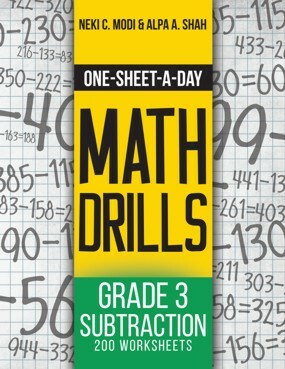 Unlike other math drill books, this is one of 24 workbooks created to establish a daily routine for each student to practice on their own from grades 1 through 7. It is specifically designed to gradually increase mathematic ability with the least amount of stress for both parent and student.